Welcome to Mindful Yoga by Sherri. 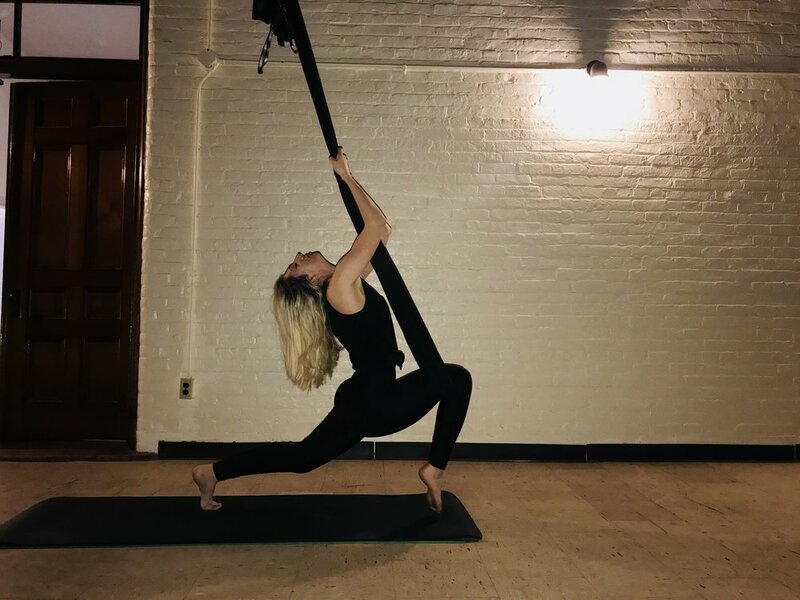 This class is a wonderful introduction to anyone new to aerial yoga and is perfect for all looking for a deep release and total relaxation. The sequence is gentle, calming, and therapeutic. Watch the tension and stress melt away. The hammock hangs 10-12” off the ground, acting as a prop providing support. By providing the opportunity to open up physically, mentally, and emotionally, you will leave feeling relaxed, refreshed, and at peace. Private/small group Aerial and Yoga SESSIONS available. Limited availability. Call the YMCA to reserve your spot. *Monthly Aerial sessions include 4 weekly classes. 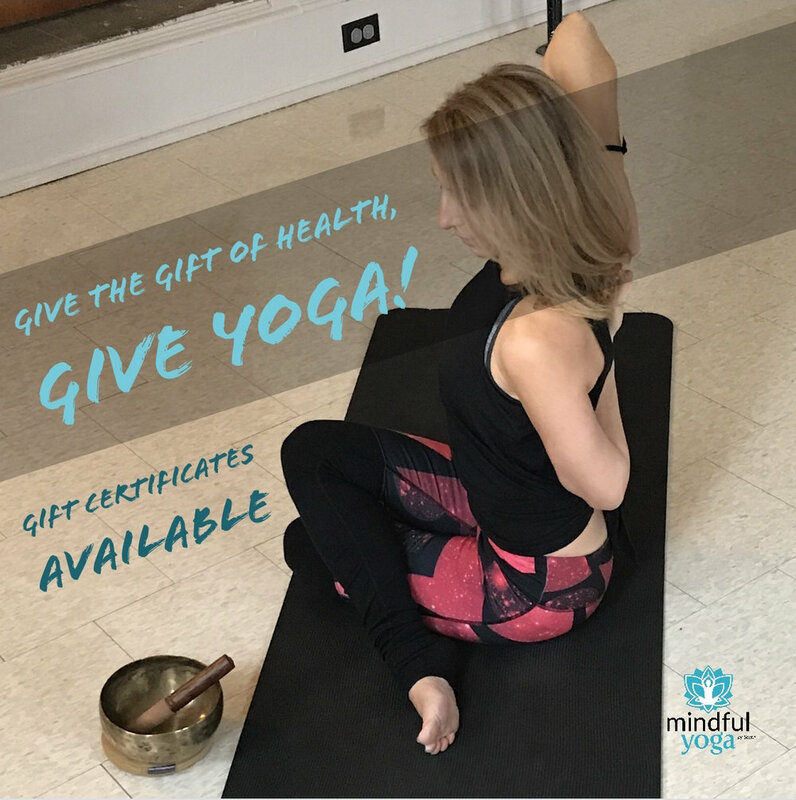 Vinyasa flow is an alignment based class where postures are linked together in a flow that combines strength and flexibility while toning the body and clearing the mind. Linking breath with movement, vinyasa yoga will build confidence and help you stay present and centered. It will awaken your strength, energy, and flexibility. This class is dedicated to balance our need for both movement and stillness. It will include restorative postures to ground and center ourselves and a gentle vinyasa flow to open the channels of our bodies. This is a perfect way to get through your work week and bring balance to yourself. 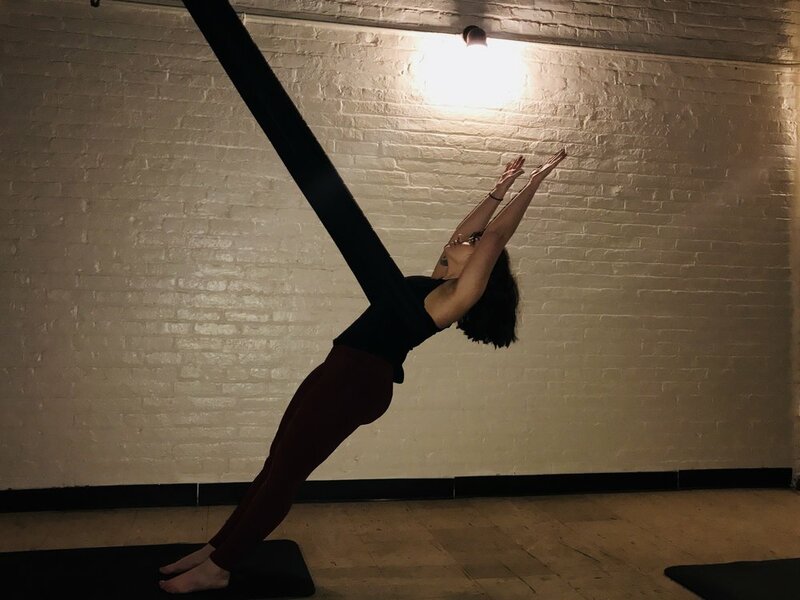 Aerial yoga increases strength, mobility and flexibility. The hammock is used to strengthen muscles and find correct alignment in poses. It is psychologically beneficial, helps heal back problems with spinal decompression, provides pain relief, improves balance, aids digestion, helps prevent heart disease, and improves memory. Aerial yoga also improves your mood by stimulating adrenaline production, releasing “feel good” hormones, leaving you feeling energized. This class will build on Beginner/Basic Aerial. Work will include refining poses and continuing exploration in linking breath with movement. Increase strength, lengthen the spine, build core strength and balance while flowing through a fun, creative sequence. This class will cover the basics of Aerial Yoga. We will use the hammock to keep proper alignment, build strength in the body and improve overall flexibility. Learn how to use the hammock in a fun, supportive environment. Benefit your employees with increased focus, reduced stress, and improved concentration by providing an onsite yoga session. Increase productivity and improve workplace morale. Make Mindful Yoga by Sherri a part of your corporate wellness program. Whether you’ve practiced yoga for years or for years have thought about practicing… give it a try!